Royal Caribbean has narrowed down the choices for who will be Harmony of the Seas' Godmother to just three amazing women. The cruise line is conducting a search for a Hometown Hero in Education for her Godmother. In selecting Godmothers, Royal Caribbean looks to capture the essence of the role by honoring women whose life lessons and achievements illustrate the kind of courage, dedication and determination that are an inspiration to all. "We’ve seen an overwhelming response from the community with an outpouring of exceptional nominations from Miami-Dade, Broward and Palm Beach counties. It is an honor to be able to recognize such inspiring educators for the work they do to make a positive impact on our youth," said Michael Bayley, President and CEO, Royal Caribbean International. "These three upstanding individuals have demonstrated unwavering passion and dedication, going above and beyond the classroom to make a huge difference in the community. We thank everyone who participated by recognizing our many heroes in education; they are leading the way in inspiring our youth to dream big, and that’s work we all can be proud of." The public can now view each of the essay submissions and vote for the educator they feel is having the most positive influence on South Florda's youth. The winner will receive a $25,000 grant for their non-profit organization, and the honor of becoming the Godmother to Harmony of the Seas. The winner will receive an invitation to the naming ceremony of the Harmony of the Seas on November 10, 2016. The Grand Prize winner will also receive A 7-night Caribbean cruise onboard the Harmony of the Seas for two in a double-occupancy balcony stateroom (winner and a guest) awarded in the form of a cruise certificate. Online voting is open from October 6 at 12:00pm to October 14 at 12:00pm EST, 2016 at local10.com/godmother.On Oct. 24, one finalist will be named the winner, and honored as Godmother of Harmony of the Seas, the world’s largest and most innovative cruise ship, during an official naming ceremony on Nov. 10, 2016. Royal Caribbean's Harmony of the Seas has generated a lot of interest among Royal Caribbean fans and first time cruisers alike, and with a ship this intriguing, there are a lot of concerns and questions people may have. We decided to list answers to some of the most commonly asked questions related specifically to Harmony of the Seas for everyone's future reference. Royal Caribbean has added a lot of great entertainment on Harmony of the Seas. Guests are able to reserve shows on their Harmony of the Seas cruise, although when exactly they become available varies from sailing to sailing. The truth is, there is no rule about when these kinds of activities become available for booking, and every sailing can be different. Typically, we see enteratainment become available to reserve online around 75-60 days prior to the sail date, but your experience may vary. What exactly is the Wonderland restaurant? Wonderland is a specialty restaurant that has a cover charge and is an imaginative take on specialty dining, where the experience is just as important as the food offered. Wonderland first debuted on Royal Caribbean's Quantum-class ships, but Harmony of the Seas is the first Oasis-class ship to offer this unique restaurant. In fact, it is a two-story Wonderland restaurant. It is loosely based on the Alice in Wonderland books, and features an eccentric design motif. Dining at Wonderland is more than just another place to eat. Rather, it is an opportunity to try something completely different and the wait staff is part of the experience as much as the food. What is Royal iQ and how does it work? 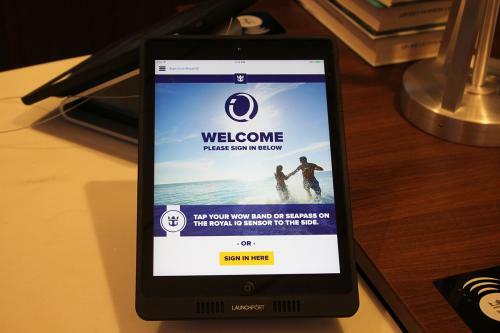 Royal iQ is Royal Caribbean's smart phone app available on Harmony of the Seas for iOS and Android devices. Royal iQ already let guests track their luggage delivery status on embarkation day, manage a personal calendar of reservations and events, communicate with other guests onboard, book shore excursions and modify existing reservations. Guests do not need a Voom WiFi plan for the Royal iQ app to work. Ideally, the app should be downloaded before the cruise and then once onboard, connect to Royal Caribbean's WiFi network and open the app. The app's core functionality provides the ability to track luggage, manage personal calendar and book shore excursions and dining reservations without any additional cost. 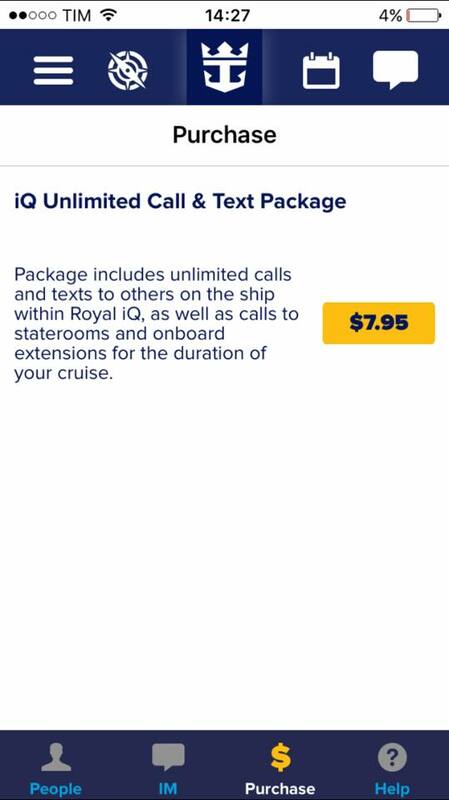 There is a communications option, which costs $7.95 for use onboard and provides the option to text or call someone else that is using the app and has activated their iQ Unlimited Call & Text Package. Each person needs to have the app for the iQ communications package to function. How do the stateroom lights work? Staterooms on Harmony of the Seas feature a card slot near the entrance to each stateroom that requires a card to be inserted into it for the lights and air conditioning to work. This ensures an energy-saving means of reducing the ship's impact on the environment. Just insert your SeaPass card (or really any card you might have) in the card slot and the lights and air conditioning will remain active as long as the card is in the slot. What makes Harmony different from other Oasis-class ships? There are a number of large and subtle differences between Harmony of the Seas and her sister ships, but here are the big ones. What is the Escape the Rubicon puzzle room? Escape the Rubicon is a puzzle game, which is a timed game where guests compete to figure out a series of clues hidden throughout one room in an allocated amount of time (usually 60 minutes) in order to find the "key" to escaping the room. Each game requires at least six guests and is located near the Adventure Ocean club. Guests can sign up for it once onboard the ship (although some guests have reported seeing it available on the Cruise Planner site). Can you open balcony partitions? If you have a connecting balcony stateroom, often guests want to open up the balcony divider between the rooms to allow for a larger balcony space. The key to getting this done is to ask the stateroom attendant. Talk to your stateroom attendant and ask if you can have the balcony dividers opened up because you are friends with the balcony stateroom(s) next to you. Who will the Captain and Cruise Director be when Harmony of the Seas does its trans-Atlantic sailing? Captain Gus Andersson will be Harmony of the Seas' Captain and Abe Hughes will be the cruise director for the repositioning cruise to Harmony of the Seas' new homeport in Port Everglades. Eventually, Captain Johnny Faevelen will resume his duties aboard Harmony of the Seas. Each Captain takes a 10 week rotation, so Captain Johnny will be the ship's Captain once again sometime after Harmony of the Seas arrives in Port Everglades. The Harmony of the Seas exhibit “The Wonder of Our World, The World We Live In,” presents over 3,000 pieces from artists spanning 60 countries. Led by curatorial director Mariangela Capuzzo at ICArt, the collection explores wonder from four perspectives— people, places, what we do and what inspires us —through an array of media. 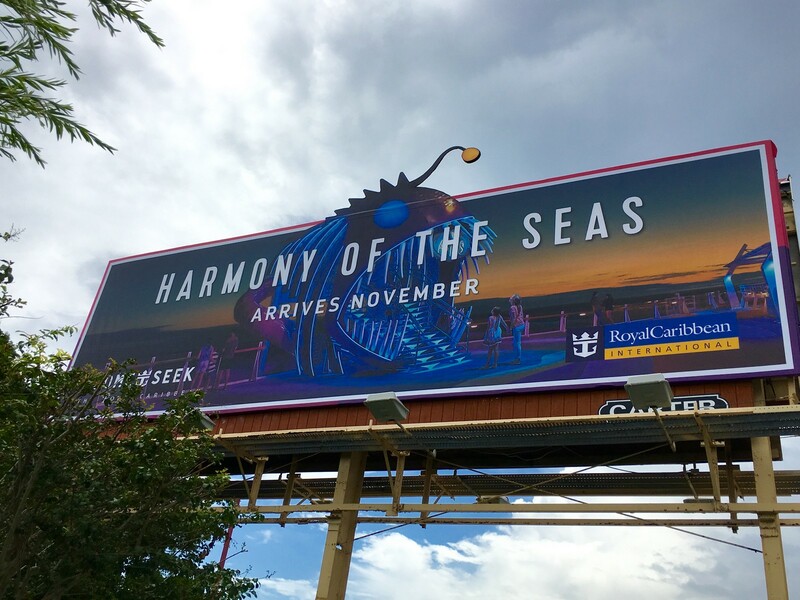 Many of the works were created specifically for Harmony of the Seas and designed to bring joy to all who sail. If you are in the Miami area (or can be), then head over to the Aventura Mall to see Royal Caribbean's latest creation that previews one of the big thrills on its newest ship, Harmony of the Seas. 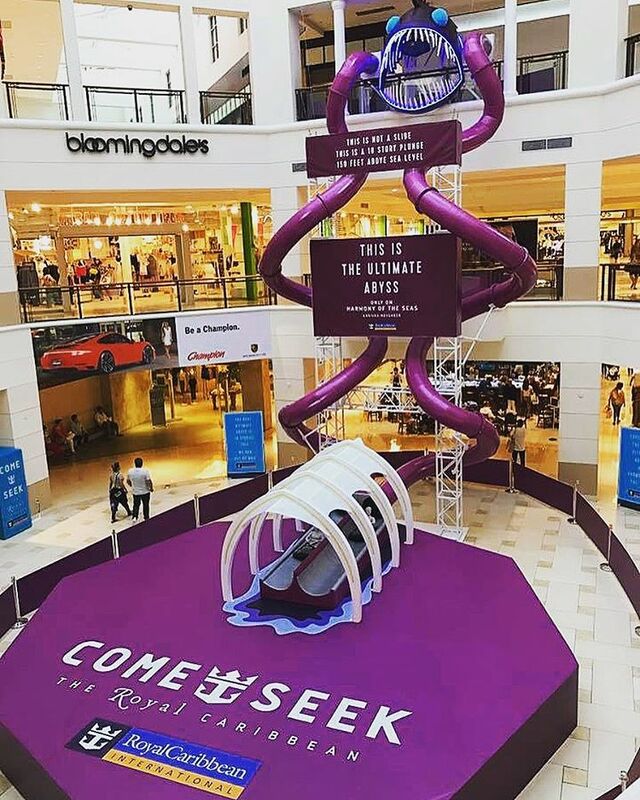 Guests in the mall can see a miniature replica of the thrilling slide found on the aft of Royal Caribbean's newest ship. The slide is a limited-time marketing idea that aims to inform Floridians of Harmony of the Seas' imminent arrival in the area, as well as showcase one of the most impressive features of the ship. Thanks to Erik Clauson aka Cruiseboy for providing these photos! Despite the fact Harmony of the Seas is Royal Caribbean's third Oasis-class cruise ship, she offers a number of different experiences that distinguish her from her sister ships. While Royal Caribbean may build many ships within a class of vessels, they are not, "more of the same," when it comes to what these ships offer. Harmony of the Seas is the newest Oasis-class ship and offers a lot of fun activities for guests to enjoy. Here is our list of the top eight ways Harmony of the Seas is different from Allure of the Seas or Oasis of the Seas. Nearly every Royal Caribbean ship is different from each other in the art work featured all over the ship. Harmony of the Seas has thousands of art pieces that Royal Caribbean has added for guests to see as they explore the ship. The art found onboard Harmony of the Seas consists of a $6.5 million art collection of more than 3,000 works. Inspired by the theme “The Wonder of Our World, The World We Live In”, artists from around the world – more than 60 countries, from Argentina and Australia to Greece and Morocco – created unique pieces to intrigue Royal Caribbean guests and crew, alike. 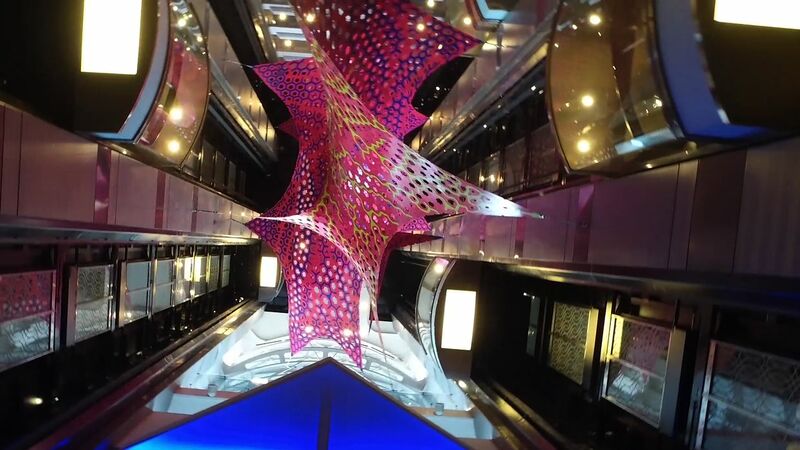 Once you get onboard Harmony of the Seas, be sure to explore the ship to discover the many pieces of art. You will find art all over the ship, from the stairways to the restaurants, staterooms and even out on the decks. If you have cruised on Allure of the Seas or Oasis of the Seas, you will know the go-to spot for a caffeine fix is Starbucks on the Royal Promenade. However, if you want a latte, frappuccino or macchiato on Harmony of the Seas, you will have to look elsewhere. Royal Caribbean decided to move Starbucks to the Boardwalk neighborhood, just outside the Carousel. In addition to the new location, the Starbucks on Harmony of the Seas is more of a real store, with seating inside and bright, colorful designs all around. Ordering your drinks at this Starbucks is very similar to ordering at any Starbucks location. The barista takes your order, as well as your payment. You then step to the preparation area and pick up your Starbucks drink when it is ready. One of the largest and noticeable differences to Harmony of the Seas is this Oasis-class ship offers a number of water slides for family fun throughout your cruise. In short, these new slides are not only something unique to Harmony of the Seas, but a really fun spot for everyone in your family to take a wet, wild ride! Speaking of slides, there is one more slide on Harmony of the Seas that involves no water, but does offer a really big thrill. The Ultimate Abyss is a 10-story dry slide on the aft of the ship that is 150 feet above sea level. Guests descend down one of two side-by-side slides that will accelerate down 10 decks at a speed of 9 miles per hour. Unlike the water slides, guests are handed a black mat with an opening for one's feet. All that someone has to do to ride is sit down, lean back, and while holding onto a strap, wait for their turn to go. Screaming optional. Oasis-class ships are known for their many dining options, and there are two restaurants on Harmony of the Seas that are not available on Oasis-class ships. Jamie's Italian is a specialty restaurant created by celebrity chef Jamie Oliver that offers rustic Italian dishes made from seasonal ingredients and tried and true recipes. It is located in Central Park and replaces Giovanni's Table, which is available on the other Oasis-class ships. In addition, Wonderland is available to guests on Harmony of the Seas. Wonderland is an imaginative take on specialty dining, where the experience is just as important as the food offered. Wonderland debuted on Quantum-class ships first, but the Wonderland on Harmony of the Seas is actually the first two-story Wonderland restaurant. It is only natural for the Wonderland on an Oasis-class ship be larger than any other! Royal Caribbean's Oasis of the Seas made big news when the cruise line added the first Broadway show at sea back in 2009, and Harmony of the Seas continues that tradition with the hit Broadway classic, Grease. The all-new stage production, specially adapted by Royal Caribbean Productions, boasts a soundtrack of crowd favorites such as “Summer Nights,” “Greased Lightnin’,” “Look at Me, I’m Sandra Dee,” “Born to Hand-Jive,” “Beauty School Dropout” and more. Not only is Grease an entertaining and fun show to watch, it is a great example of the first class entertainment Royal Caribbean is known for. Speaking of shows, Royal Caribbean did not just "copy and paste" its entertainment line-up from other Oasis-class ships for Harmony of the Seas. A number of brand new productions are available on Harmony of the Seas that are shown throughout the ship and a brand-new experience for all guests. Columbus, The Musical! : An original Royal Caribbean production created in the spirit of “Spamalot” and “Something Rotten,” the story recounts the imagined history of Marvin Columbus, Christopher’s fictional, down on his luck, distant cousin. A breathtaking and revolutionary set design, transporting the audience across the Atlantic to the Caribbean, will awe the entire family and adults will thoroughly enjoy the smart, nuanced humor. The Fine Line: A journey from extreme to extraordinary, The Fine Line is the AquaTheater redefined with high-flying feats, mind blowing stunts and physically demanding acrobatics brought to life by the world’s best extreme-sport athletes. Designed as a 360° immersive entertainment show, revelers will be wishing for eyes in the back of their head to take in all the action happening around them. 1887: An original Royal Caribbean production about love and adventure that begins in Paris on February 14, 1887 at the height of the career of Jules Verne, renowned author of timeless adventure novels such as “Journey to the Center of the Earth” (1864), “Twenty Thousand Leagues Under the Sea” (1870), and “Around the World in Eighty Days” (1873). Puzzle Break Escape the Rubicon: A 60-minute escape room game, where guests must work together to solve a puzzle from the hidden clues in the room that will eventually unravel the mystery of the Rubicon. Totally Awesome 90s: Harmony of the Seas debuts the evolution of Royal Caribbean’s much-loved Promenade 70s Party as the clock is pushed forward to the 90s. Guests can party it up in a new era when soundtracks are dominated by teen pop, dance-pop and the growing popularity of hip hop. A live DJ spinning favorite 90s hits, live pop-up performances and crazy neon track suits set the stage to transport party goers back to this totally awesome decade. Harmony of the Seas is the first Oasis-class ship to offer the same robotic bar that made headlines on the Quantum-class of ships, the Bionic Bar. The idea is simple: guests place orders via tablets and then can watch the robot bartenders start mixing the cocktails. Bionic Bar combines two big trends, robotics and mixology. A really big photo is being planned by Royal Caribbean that involves all three of its Oasis-class cruise ships in one place very soon. Royal Caribbean CEO Michael Bayley confirmed that the company will take photos of the three ships together in coordination with Harmony of the Seas' arrival in the United States in a few short weeks. "We're trying to arrange all three Oasis-class to be next to each other, off the coast of Florida on November the 4th in the afternoon," Bayley said at an event aboard Allure of the Seas earlier today. The plan is for Oasis of the Seas, Allure of the Seas and Harmony of the Seas to appear together on November 4, 2016. Royal Caribbean will also invite guests up to the helipad for additional photo opportunities. Royal Caribbean held a similar event back in 2010, when Oasis of the Seas and Allure of the Seas met at sea. In less than two months, Royal Caribbean's Harmony of the Seas will be arriving at her new home port of Port Everglades, Florida, and it will mark her debut in the United States. Harmony of the Seas is not only the largest cruise ship in the world, but also marks a significant moment for many Royal Caribbean fans because this brand new cruise ship offers so many enticing options. In anticipation of Harmony of the Seas' arrival, we are counting down the top reasons you ought to be excited to welcome Harmony of the Seas "home". For guests that enjoy thrills on their cruise, Harmony of the Seas offers some brand new slide experiences that are not only new to the Oasis-class of ships, but offer a lot of fun for the entire family. Harmony of the Seas features three water slides: Cyclone, Typhoon and Supercell. Cyclone and Typhoon racer slides twist and turn, while Supercell slide is a "champagne bowl" slide, which has clear sections so guests can see those riding the slide. Guests exit Supercell in the Beach Pool. There is also a slide exclusive to Harmony of the Seas, known as The Ultimate Abyss. This dry slide is 10 stories high and located on the aft of the ship, making it the tallest slide at sea. The Ultimate Abyss is more than 150 feet above sea level and offers side-by-side slides that send guests down 10 decks at a rate of 9 miles per hour. Once at the top of the slide on deck 16, you will be handed a black mat with an opening to place your feet. You then sit down, lean back, and while holding onto a strap, wait for the "Go" sign to turn green. Screaming is optional. Royal Caribbean has a reputation in the cruise industry for offering terrific shows on its ships, and Harmony of the Seas has an array of new productions that are must-see once onboard. Harmony of the Seas features an all-new stage production that has been specially adapted by Royal Caribbean of Grease. The show, which features hit songs such as “Summer Nights,” “Greased Lightnin’,” “Look at Me, I’m Sandra Dee,” “Born to Hand-Jive,” “Beauty School Dropout," is available to see on Harmony of the Seas. Royal Caribbean also created a number of original productions, including its own musical, "Columbus - The Musical". This new show was created in the spirit of “Spamalot” and “Something Rotten" and tells the tale of Christopher’s luckless distant cousin, Marvin, on a madcap voyage to the Caribbean. Want more? Guests will find many more shows and events onboard Harmony of the Seas, including new original productions in the AquaTheater, ice skating rink and Royal Theater. And there is still more, including a 90's dance party on the Royal Promenade, escape room experience and the DreamWorks Experience. In short, there is lots to see and do on Harmony of the Seas. Harmony of the Seas may be the third Oasis-class ship Royal Caribbean has built, but it has some brand new dining experiences that are not found on her sister ships. Guests dining on Harmony of the Seas can sample the classic Italian creations of celebrity chef Jamie Oliver at Jamie's Italian, which offers rustic Italian dishes made from seasonal ingredients and tried and true recipes. If you want a little bit of adventure with dinner, Wonderland will capture your imagination (and your taste buds). Wonderland is an imaginative take on specialty dining, where the experience is just as important as the food offered. While Wonderland is on a few other Quantum-class ships, on Harmony of the Seas, this is the first two-story Wonderland restaurant in the fleet. In addition to these two remarkable restaurants, Harmony of the Seas is filled with a vast array of complimentary and specialty dining choices. Oasis-class ships were designed with dining in mind, and guests on Harmony of the Seas will find a smorgasbord of dining choices! Families that love to spend lots of time by the pool are going to love the improved aqua park on Harmony of the Seas known as Splashaway Bay. This bigger, better kids aqua park features slides, water cannons, waterfalls and more. Royal Caribbean designed this area to be a new "aquatic adventure park," for kids and toddlers with sea creature water cannons, winding slides, a gigantic drench bucket and a multi-platform jungle-gym to keep everyone entertained for hours. Splashaway Bay is another big difference between Harmony of the Seas and the previous Oasis-class ships, and offers an industry-leading spot onboard for families to have a lot of fun exploring (and getting soaked). At the end of the day, Harmony of the Seas is going to be an exciting moment because she is the largest cruise ship in the world and that alone signifies a big change (no pun intended). Royal Caribbean designed its Oasis-class ships to be a floating hub of dining, entertainment and activities, and Harmony of the Seas is included in that mold of amazing cruise ships. What are you most excited about to experience on Harmony of the Seas? Share your thoughts in the comments! 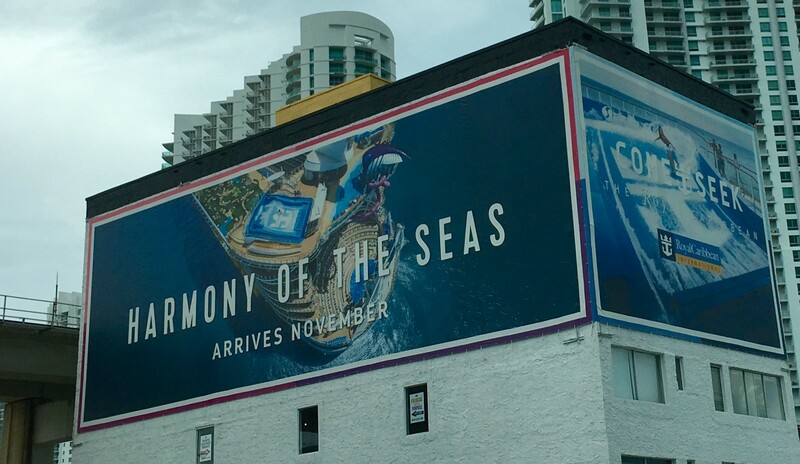 Royal Caribbean's Harmony of the Seas is nearing her arrival to the South Florida area later this year, and Royal Caribbean has posted billboards around Miami to advertise the world's largest cruise ship. Royal Caribbean Blog reader Victor Sacal shared these photos from around Miami, and we wanted to give our readers a "taste" of the excitement this new ship is bringing.